Andy Kaufman, star of Saturday Night Live, Taxi and (in a lesser known role) Larry Cohen's God Told Me To, is one of the wildest, hilarious and brilliant comedians of all time. Much has been written about Kaufman and there was even a biopic starring Jim Carrey. Kaufman's mysterious death has long since been a topic of discussion among fans and conspiracy theorists. I have been a fan of Andy Kaufman for a long time and always wanted to know the truth about his death so this DVD seemed like the perfect way to find out the truth. The Death of Andy Kaufman features director Christopher Maloney on a pilgrimage to find out what the truth is surrounding Kaufman's mysterious death. There have long since been rumors that he faked his death and is still alive. Maloney displays many inconsistencies with the reports of his death and how he actually could have faked it. He travels to places that he has heard Kaufman was spotted recently to see for himself if there is any truth in the rumors. After all the facts are laid out and the conspiracies mostly debunked, the film shifts into a loving tribute to one of the greatest comedians of all time. 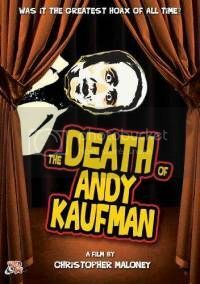 The Death of Andy Kaufman is a smart, well made documentary on a much disputed topic. Death conspiracies always interest me and this is no exception. The way the film shifts from the conspiracy theory to a film about Kaufman's contributions to the entertainment business makes it quite original and uncovers more about Kaufman than just his death. There is a lengthy interview with Kaufman's brother that shows that even he can never be completely sure that Kaufman is dead but that it's more important to just remember him for the genius and kind person that he was. This documentary also features a half hour interview with the director and trailers.